Like all self-respecting amateur astronomers, I have a bad case of “Aperture Fever” - you never have enough aperture, and you can certainly never have too much! They ticked pretty well all of the boxes for me. About the only thing I could criticize is that they are only “Fully Coated” rather than “Fully Multi-Coated” - but for the low asking price, I figured I could live with this “omission”. Plus of course, there's the open question of build and optical quality … They seemed to get good reviews overall, and they are certainly affordable, so there was only one way to find out…. I found an international seller who offered them for AU$94.95, including expedited delivery to Australia, so I took the plunge and ordered a pair on Thursday last week - and they were delivered in Brisbane exactly one week later - very happy with that! The binoculars came very well packed, and arrived without any damage. I unpacked them and took a look at what I had bought. 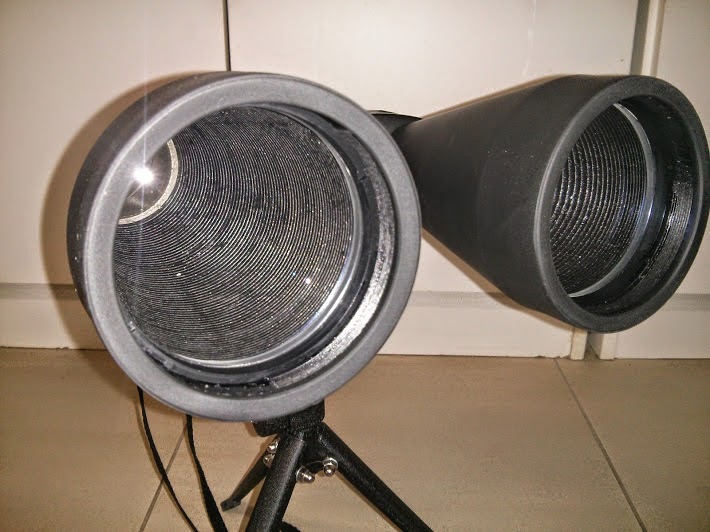 The binoculars themselves feel solidly built and have a nice “heft” and balance. 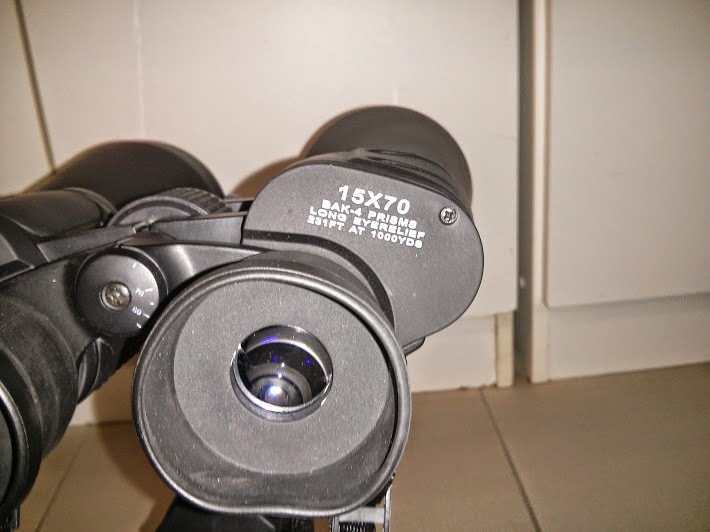 The fold-down cup on the right eyepiece is a bit "buckled" (I guess it has been "crushed" in the box for some time) - I'm not sure if it will straighten out over time, but it doesn't detract form the use of the binoculars. Apart from that, no problems at all. The table-top tripod and tripod adapter are somewhat surprisingly not complete rubbish - the tripod is metal and seems quite sturdy, but I'm not sure how often I will have a table to set them up on, and in any case, you can really only use them near-horizontal on such a small tripod, so it is really only useful for terrestrial viewing. The carry case and neck strap are pretty basic (the neck strap is really WAY too thin for hanging these babies around your neck! ), so an upgrade to a better wider padded strap is on the cards. The case is thin and soft, with minimal padding, so won't provide much protection from bumps and knocks, but my binoculars will live safely at home, and the case is really only going to be a dust cover, so I can live with that. 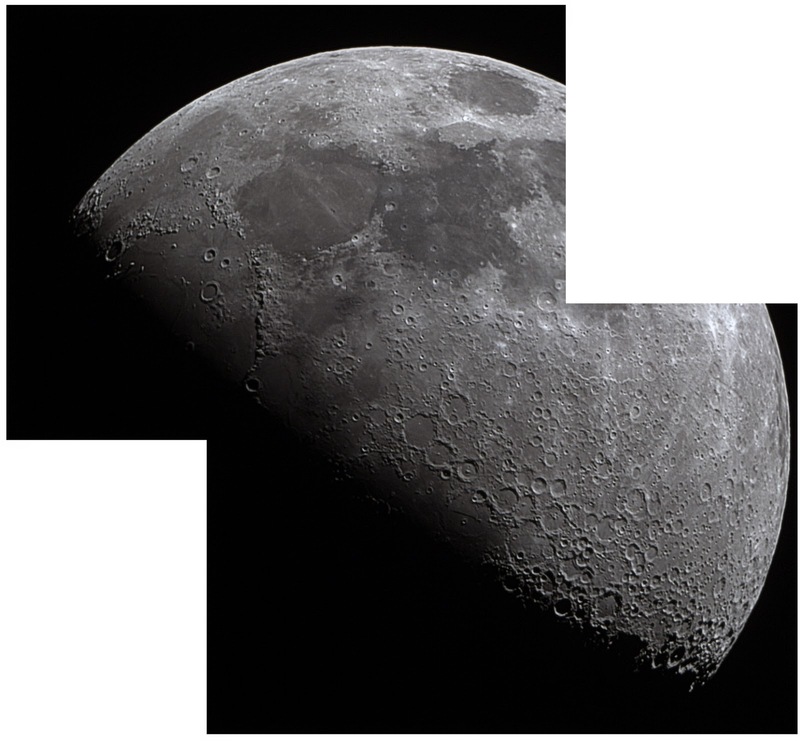 I was pleased to find they were perfectly collimated, and provide a bright, sharp image all the way to the edge of the 65-degree apparent field of view (4.4-degrees actual field of view at 15x magnification). There’s a bit of distortion and Chromatic Aberration at the edge of the field of view, if you look hard, but because these have a nice wide field of view, it really doesn't detract from the overall view. The distortion is there, but you can only really see it if you position a straight line (such as a building or power pole) near the edge of the field of view; it’s basically not noticeable on more “natural” targets. 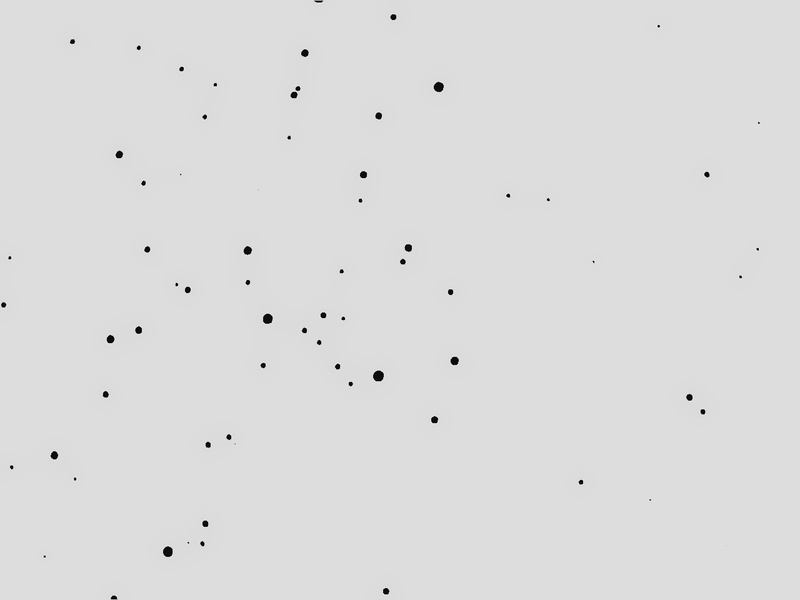 The CA is only apparent on bright, high-contrast targets near the edge of the field of view. These defects are only apparent if you switch your gaze from the centre to the periphery, and the effect disappears if you swing the binoculars to bring the main target more central. But of course it was really their night-time use that I really wanted to test out! When the Sun had set, and family duties had been attended to, I settled down in a camping chair in the back yard with my Pentax 10x50s, my new Barska 15x70s, and a couple of tripods. It’s New Moon at the moment, so checking out the Moon is out of the question for a few days, so my first targets were some old favourites that were favourably positioned - the globular cluster 47 Tucanae (NGC 104), the Great Nebula in Orion (M42), Andromeda Galaxy (M31), and Ptolemy’s Cluster (M7). 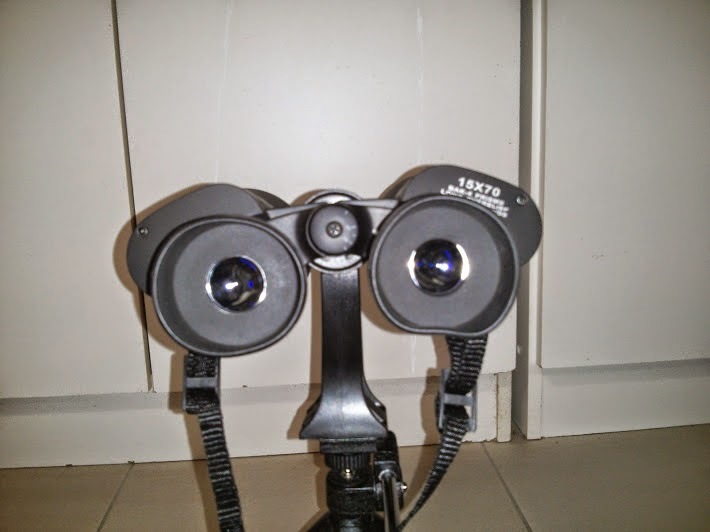 I swapped back and forth between the two binoculars a few times on each target, to compare the views. And I was very impressed! 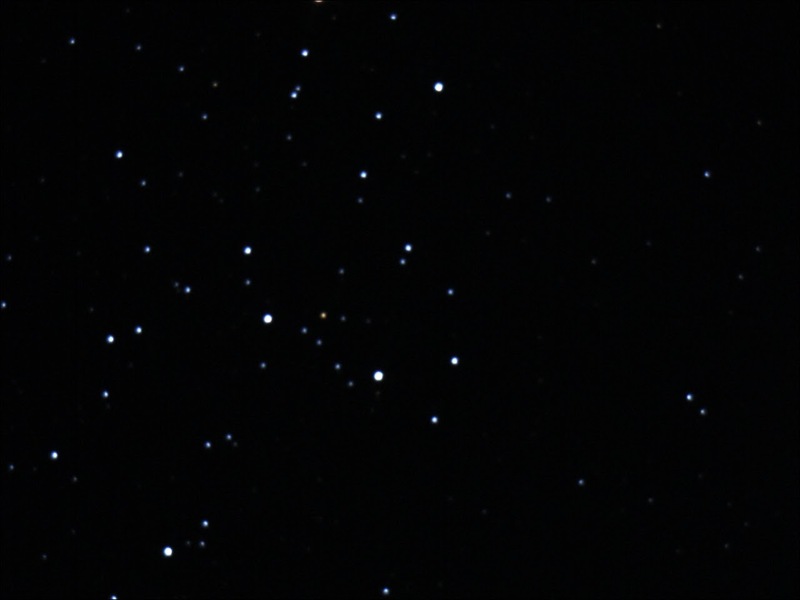 The 15x70s show significantly more stars than the 10x50s, and the higher magnification tends to darken the background sky as well, which also helps in seeing very faint stars, and brings diffuse targets such as nebulae and galaxies into better contrast against the sky. Looking at nebulae and galaxies revealed a bigger apparent area (as the fainter edges could be resolved more clearly), and showed more detail and "structure" within the “body” of the nebulae as well - and all at 50% higher magnification than the 10x50s. The 4.4 degree field of view is ample for viewing pretty well any night-sky target, apart perhaps from seeing an entire constellation in a single view, for which the 10x50s with their 6.5 degree field might be preferable. The 10x50s are light and compact enough to be held steady for extended periods, but the bigger and heavier 15x70s definitely test your endurance after a short period. My tripods just aren’t the right size and shape for convenient binocular stargazing use while sitting in a comfortable chair (you really need a parallelogram arm for this), and of course the higher magnification amplifies the shakes. However, I found that folding up the legs of a tripod to make a monopod worked very well (especially with the pan / tilt head) - just plant the base of the “monopod” on the ground ahead of you, and lean it back to bring the binoculars up to your face, and use the pan / tilt to get the alignment just right; then lock the pan / tilt, and you have a nice steady platform which requires virtually no arm support other than a bit of light guiding. 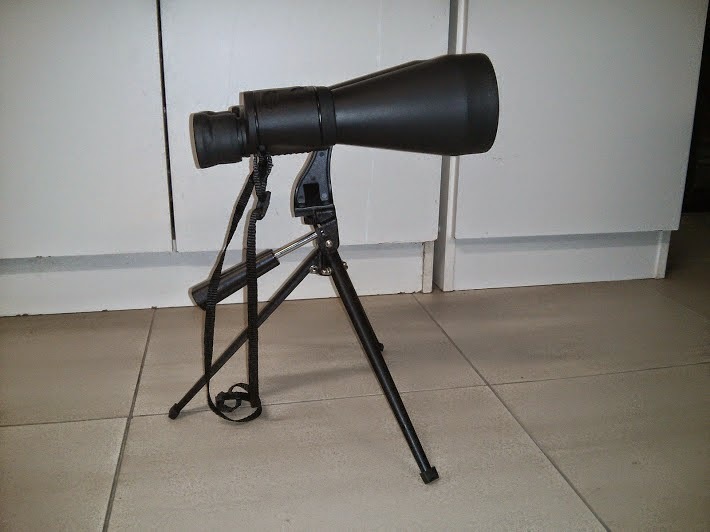 While playing around, I also found that the supplied table-top tripod also makes a handy “pistol grip” mount, which allows you to hand-hold the binoculars much more steady than conventional hand-held use. 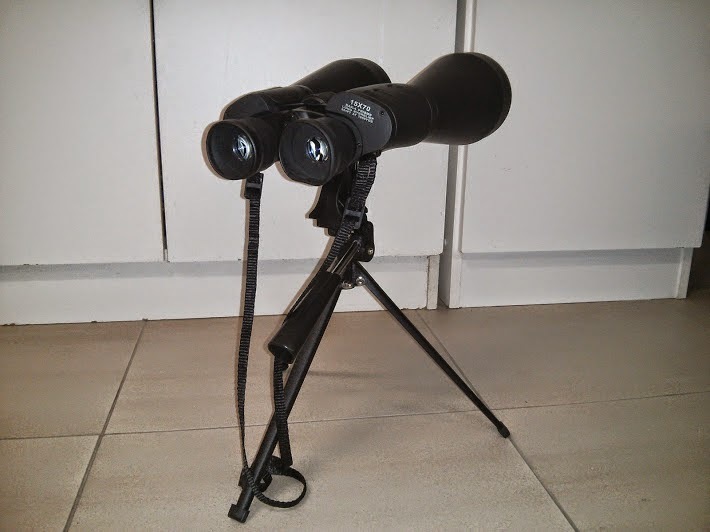 I folded the three legs together to make a single “grip” for my left hand, and turned the pan / tilt handle 90 degrees to the right (rather than it's normal orientation in-line with the binoculars); then holding the pan / tilt handle in my right, it is actually possible to hold the binoculars much more steadily and comfortably than the normal handheld position. I'm not sure why this is - it’s probably because your arms are comfortably resting down on your chest rather than being held elbows-out in front of your chest, but if you doubt me, try it - it might work for you too! All in all, I’m very happy with my purchase! My only quibble is that I now have even more equipment to cart around - the 10x50s give a wonderful wide view for hand-held terrestrial and “wide sky” use (e.g. 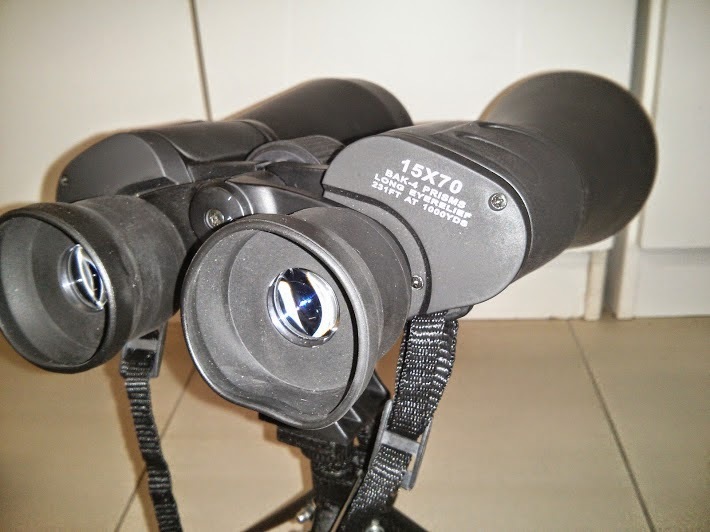 meteor spotting), and are light enough to throw in a backpack, but the 15x70s will be my “go to” binoculars for stargazing use, especially when I have a chair and a “monopod” to make them comfortable to use for extended viewing sessions. Have you ever wanted to know what that bright light was that you just saw whizzing past overhead? While it COULD have been a UFO or a meteorite, if it was evening (or pre-dawn), and it didn't look like an aeroplane, then there's a good chance that it was a satellite of some sort. "Heavens Above" http://www.heavens-above.com/main.aspx is a great resource for finding out what that thing was, or for getting notifications in advance of upcoming visible spacecraft fly-overs. In particular, keep a look-out for the International Space Station and the "Iridium Flashes" in your neighbourhood - these can be VERY bright! Now there's no longer any need to print out your satellite-pass charts and tables before heading outside for a spot of spacecraft-spotting - just take your phone / tablet with you, and get real-time tables and charts on demand. 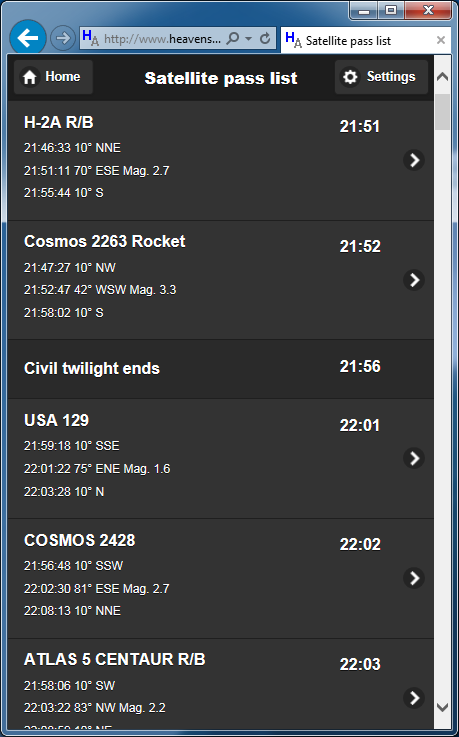 "Live sky" chart will show you all the current visible satellites as they move across the sky. This is probably the most convenient display for an evening's viewing, as no navigation between pages is necessary. Predictions include all visible satellites up to a configured magnitude cutoff, plus Iridium flares. Location can be obtained from the phone itself using the HTML5 geolocation service. The site is implemented as a single HTML file and so transitions between pages do not require fetching data from the server. Runs on any device with an HTML5 capable browser (most modern Android and iOS devices). Makes use of the jQuery Mobile framework for a consistent "look and feel". Pages are currently optimised for the smart phone format, but can also be used on tablets. A tablet-optimised layout will be available shortly. The first version of the prototype is only available in the English language, but other languages will follow. The brightest star is V862 Scorpii at magnitude 6.76 (the slightly yellowish white star just below the centre of the image). The faintest visible stars are about Magnitude 11.5 - not bad for a 5 second exposure! 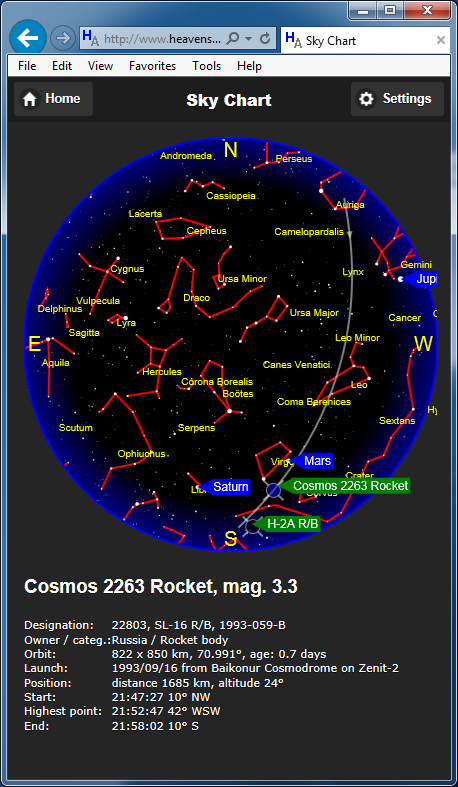 The colours are all pretty accurate, when I compare with standard planetarium software. For any given set of exposure settings, on a digital image there is a really nice linear relationship between the diameter of the star image and the apparent magnitude of the star. (When shooting time exposures on film, the relationship between the image diameter and the actual brightness of the star is much more complex.) This graph shows the relationship for a selected sample of stars on this particular image (bearing in mind I was only measuring the apparent diameters to about 0.5 mm accuracy when printed at A3 size). This means that with a few stars of known magnitude in frame, you can estimate the magnitude of all the other stars. I'll have to try this on a few variable stars and see if I can measure their variability, and do some “real science”! 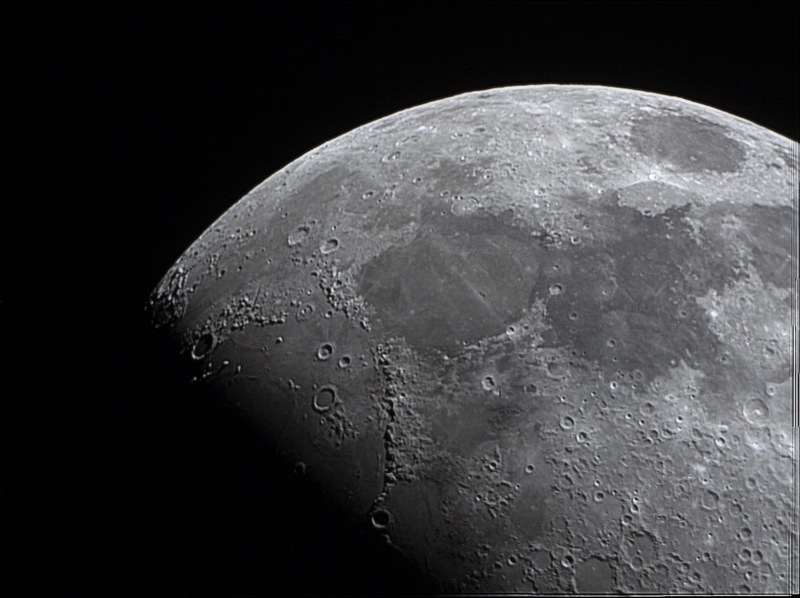 Free Astronomy courses on Coursera - highly recommended! This one looks like it is fairly analytical, but shouldn't be impossible if you remember a bit of your high school physics and maths. 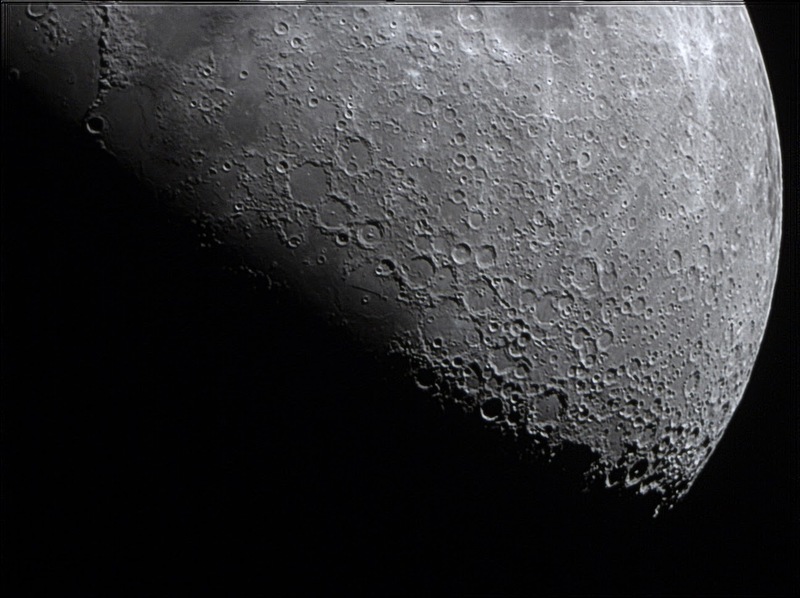 Earlier this year, I did the "AstroTech" course offered by Edinburgh University https://class.coursera.org/astrotech-001, which was a really good introduction to the technology used by modern astronomers - this one had a pretty light "theory" load, so would suit amateur astronomers with any level of formal science / maths education. For something which was a lot more challenging, but absolutely fascinating, take a look at "The Science of the Solar System" https://class.coursera.org/solarsystem-001, presented by "Pluto Killer" Mike Brown http://en.wikipedia.org/wiki/Michael_E._Brown of CalTech. Enough tinkering with the hardware and cooling, etc - it's time to take some pictures! Even though my CPU cooler came with a fan, I was hoping to get away with running it without a fan to avoid vibrations etc. However, even though I've been running the TEC at only 6 volts, I've noticed that sometimes the camera sensor temperature will stabilize at a Delta-T of about 12 degrees Celsius below ambient, but will sometimes then climb back again almost to ambient after a while, especially in warmer ambient air. As long as the top radiator stays cool enough to re-condense the fluid in the Heat Tubes, it can pump heat away from the hot side of the TEC, and everything works nicely. 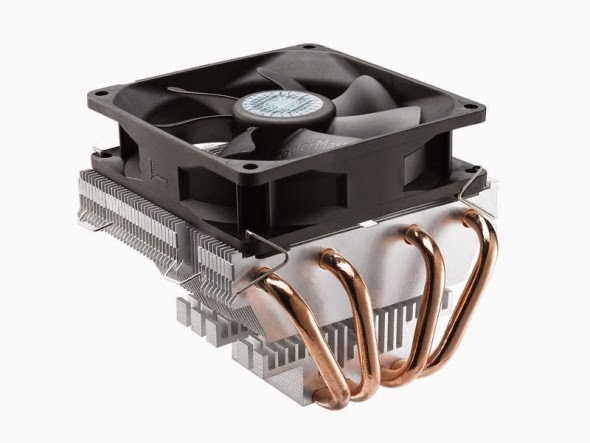 However, if the top radiator gets too hot to allow the fluid to condense effectively, the Heat Tubes lose their ability to pump the heat efficiently, and the whole CPU Cooler assembly gets quite hot, and the TEC starts to heat up again, including the cold side. 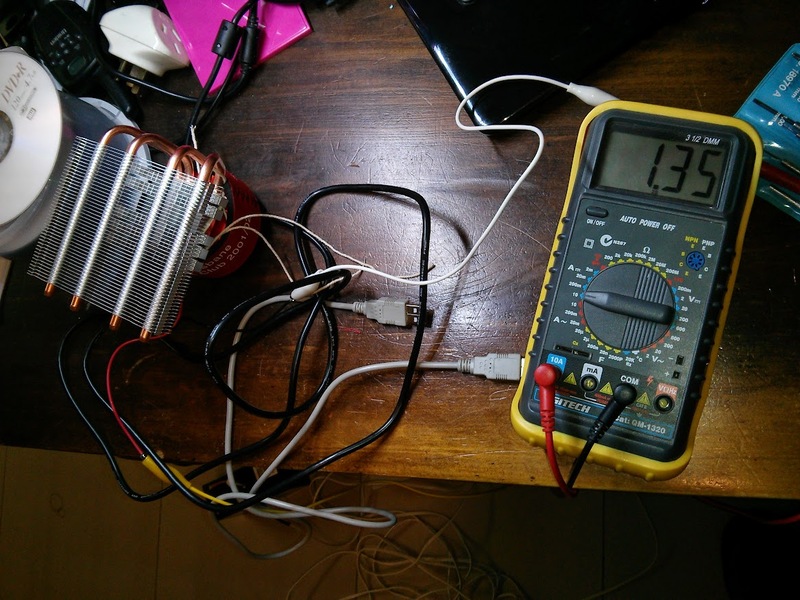 It looks like my CPU cooler without a fan can pump the heat from the TEC running at 6 volts effectively as a passive device (no fan), with ambient temperatures of up to about 24 Celsius or so, maintaining a Delta-T on the camera sensor of around 10 to 12 degrees. 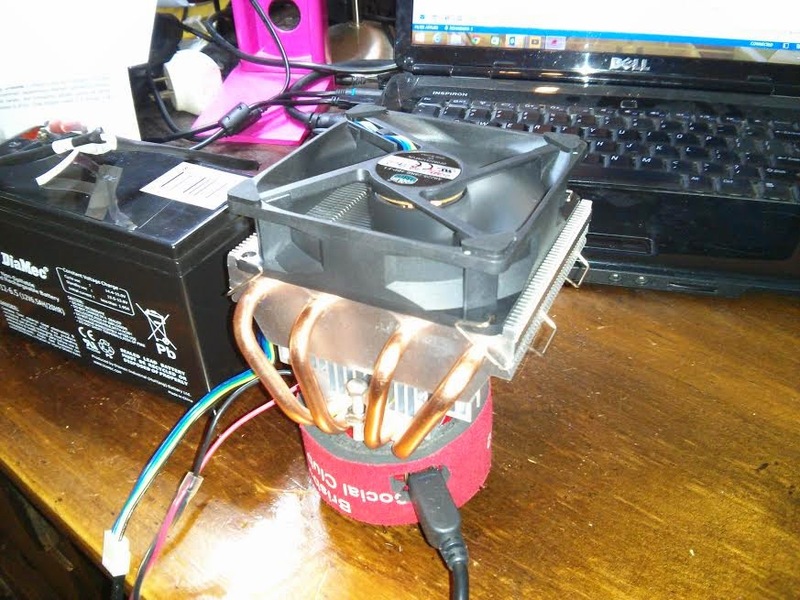 However, at a certain critical heat load and / or critical ambient temperature, the fan-less CPU cooler can no longer shift the heat without the cold side of the TEC warming up again. The fan is rated at 12 volts, but since I'm running my TEC at only 6 volts, I thought I'd run the fan at 6 volts as well. Secondly, the top radiator and copper heat pipes go from feeling warm-to-hot without a fan, to feeling quite cool to the touch - barely warmer than ambient -so the fan forcing is REALLY helping! And with ambient temperature of 28 degrees, the camera temperature sensor dropped quickly from around 15 degrees (which was about the best I could do without a fan) down to just 2 degrees Celsius - and it stays there! That's a Delta-T of 24 degrees Celsius, compared to a (sometimes-unstable) 10 to 12 degrees that I was getting before! I'll definitely be trying the fan-forced cooler outside next chance I get! 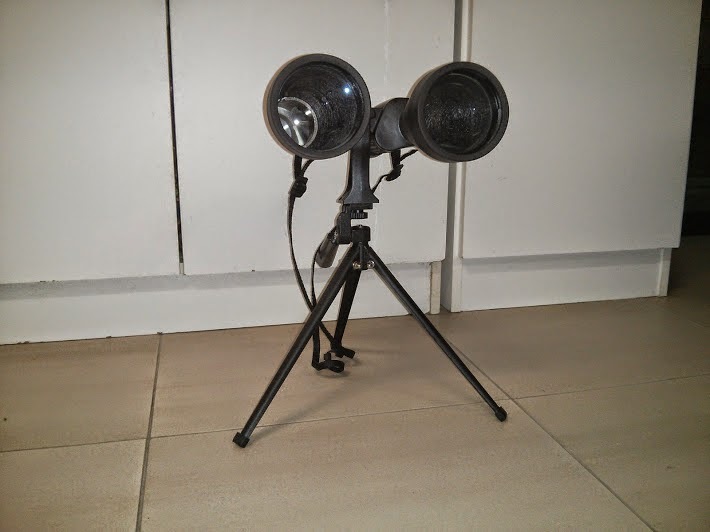 I bought myself a Peltier Thermo-Electric Cooler (TEC) to have a go at cooling my ZWO ASI120MC telescope camera, to see how it goes at reducing image “noise”, especially for longer time exposures. These things are as cheap as chips (literally!) - I got mine for AU$1.91 on eBay, including postage! 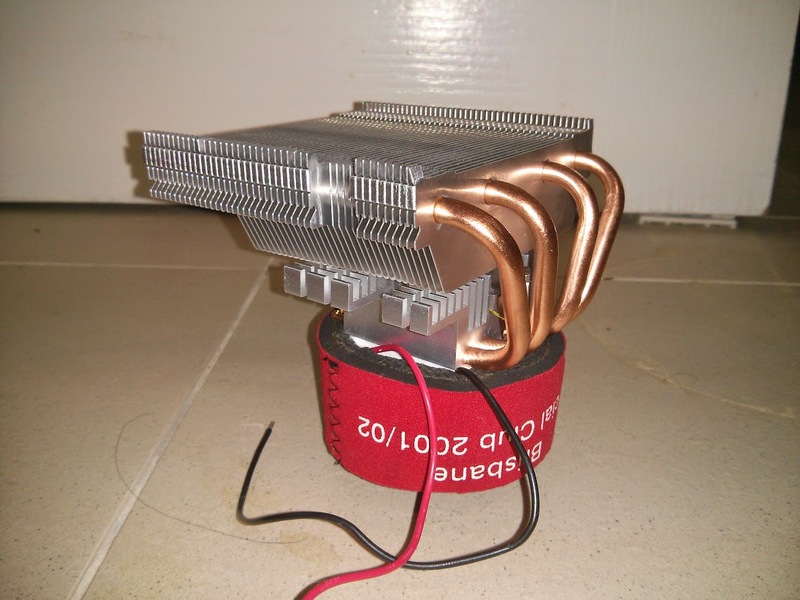 I was hoping that with good heat conduction from the hot side of the TEC straight to the heat-sink, this would allow sufficient heat exchange to achieve satisfactory cooling without needing a fan to shed the heat load. 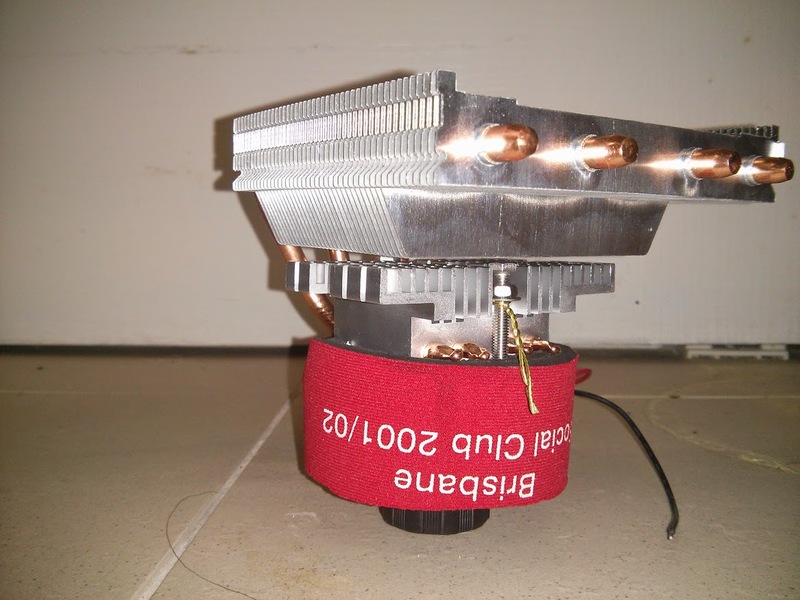 However, early trials with a heat-sink and the TEC running at only 6 volts showed this wasn't going to work - the heat-sink got VERY hot to touch (maybe 70 to 80 degrees Celsius, at a guess? ), and the camera sensor on the cold side of the TEC only registered a temperature drop of a couple of degrees C below ambient. Clearly, I need something with a LOT more heat-moving capability to get the heat away from the hot side of the TEC. This unit comes with a fan, but I thought I’d have a go at installing it as a passive device first, and fit the fan only if I need to. For now, I have held the whole assembly together using 2 M4 screws, and a bit of wire to pull the whole lot into a rigid assembly with good contact between the elements - I will probably rig up a more solid clamping mechanism for the final build. Then I wrapped the camera body in a cut-off stubby cooler (or “Koozie” as I think they are known in the USA) to provide insulation to minimise the amount of stray heat leaking into the camera body. Time for a test-bed run! I then hooked the TEC up to a 6 volt SLA battery running through a multimeter to measure the amps. The meter showed the TEC was pulling about 1.5 amps initially, but straight away, the sensor temperature started to drop, and as it fell, the amperage also dropped off a little bit as well. The bank of cooling fins on the top of the device were getting warm to touch, but not hot - I would guess around 30 to 35 degrees Celsius or so. The finned block of aluminium at the base of the heat pipes, which is in contact with the hot side of the TEC was even warmer, but not burning hot to touch - I would guess about 50 degrees or so. The camera body that I could feel at the bottom end of the insulation "skin" was getting very cold to the touch (but not freezing cold). Now I know how Dr Frankenstein felt: "It's alive!" After about 5 minutes, the sensor had stabilised at about 14 degrees Celsius, and the meter was showing about 1.3 amps. 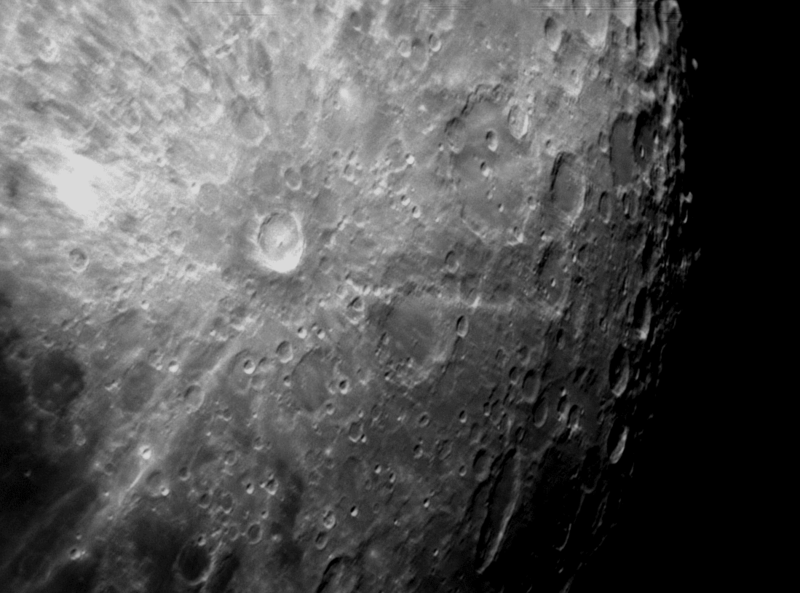 Not bad - I had achieved a Delta-T of around 12 to 14 degrees Celsius on my first attempt! And here's a sample of the image noise when the sensor had dropped to around 14 degrees Celsius, using the same 30-second exposure / 90% Gain - the noise level is certainly much better. Both images are straight off the camera as captured in FireCapture, with no “Dark Frame” suppression, and no post-processing of any kind. For actual imaging, I would cool the camera first, then take a Dark Frame in FireCapture to suppress the noise before capturing any images - thereby giving a significant improvement over the ”raw” image sensor data. Further experiments and results to follow. I'm hoping performance is satisfactory with the TEC running at 6 volts, which should mean I can run both the TEC and the scope for several hours.I might also see what it will do running at a full 12 volts. (Theoretically, it should achieve a significantly better Delta-T, and therefore a significantly lower temperature at the sensor, when running at 12 volts.) I might need a bigger battery if I want to run as 12 volts, though - the TEC could pull about 3 to 5 amps at 12 volts, so my 7.2 A-hr battery could be exhausted in an hour or two when powering both the TEC and the telescope mount. If I need to run at 12 volts to get adequate cooling, I guess I'll buy one of those car jump-starter battery packs - so much for this being a cheap hack!